Grammar Giggles – Beware Search and Replace! Comments Off on Grammar Giggles – Beware Search and Replace! I’m sharing this one from my own desk. As a rule, I don’t trust global search and replace, but thought it was probably OK to replace “Company” with “City” in a document. What are the chances that it wouldn’t work? Well, apparently there was a very good chance. This was the result of that global search and replace. 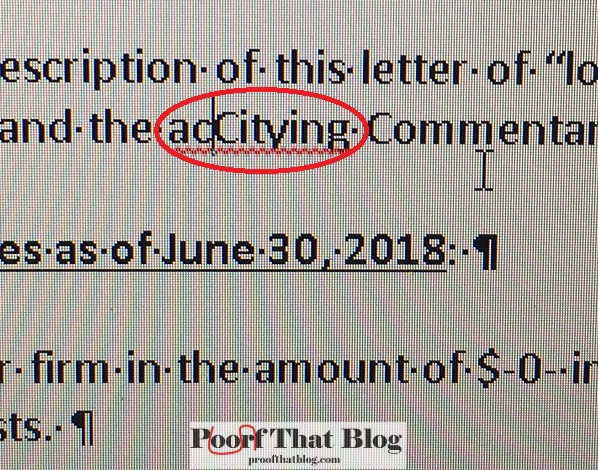 Luckily, I actually read the document after making the switch, so I found this and was able to correct it before anyone else saw it. Just another example of why you can’t just use software options without making sure it does EXACTLY what you need EVERY time you need it.